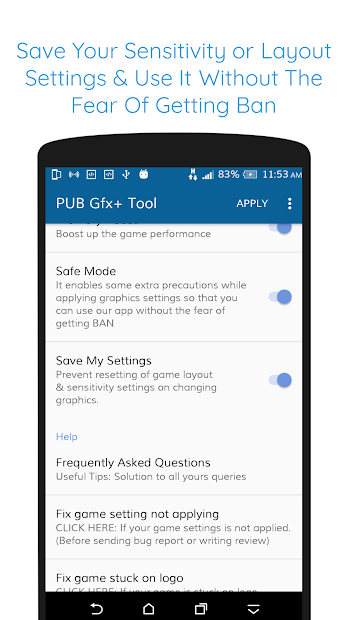 Best GFX Tool: Currently rank #1 GFX Tool on Google Play Store. 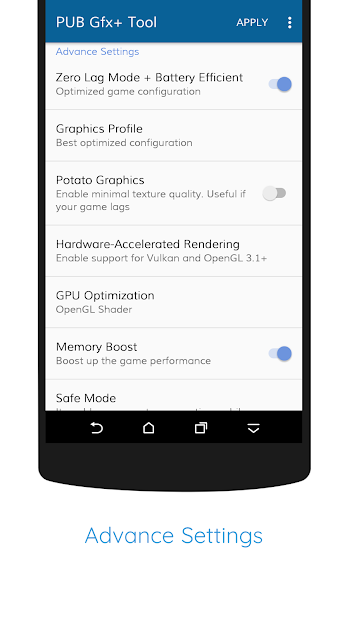 Featured on XDA Portal: Recommended and tested by XDA Developer(Most famous developer community) for improving game performance. The Most Advanced GFX Tool for optimising battleground gaming experience. Customise your game graphics like a pro. ߑ頼b>Best settings for your device: Now you can apply the graphics settings of high end devices (like Pixel/S9/OnePlus/Poco/Note 9/Razer/Xperia XZ3/Moto Z2/OppoF9/Vivo NEX etc) on your device. Simply, Look for your favourite settings and import it. Help and Frequently Asked Questions contains useful tips and solutions to all your queries. ߑ�b> Use of PUB Gfx+ tool DOES NOT leads to BAN unless someone reported you or game developer notice suspicious activity from your device i.e. using script/mods/illegal plugins to cheat game engine/server. Permission : Storage (Photos/Media files) for modifying graphics settings. Permission : Internet for loading settings from our server. Permission : Kill background app for boosting memory. "This app is developed for specific game and we are not affiliated with Tencent." DISCLAIMER: Trilokia Inc. do not deny or confirm that our graphics tools may lead to ban. We will not take responsibility of anything that might happen to your account such as account suspension or account ban. All trademarked names and images are only used as references and we do not intend to violate or take ownership of these names and images..